Salsbury Mailboxes are U.S.P.S. approved and are made entirely of aluminum. Constructed of a 1/8″ thick extruded aluminum body with a 1/8″ thick die cast aluminum front door and rear cover. The die cast door is attached to the body with a full-width stainless steel hinge allowing for smooth operation. Features a durable powder coated finish and includes a magnetic door catch. Salsbury Industries has excelled in the field of manufacturing since 1936. List Price $125.00 – Mailbox Remedies will find you the best price available on the internet. In most cases, we can beat the listed price of $125.00. Our best price will be reflected in your quote. 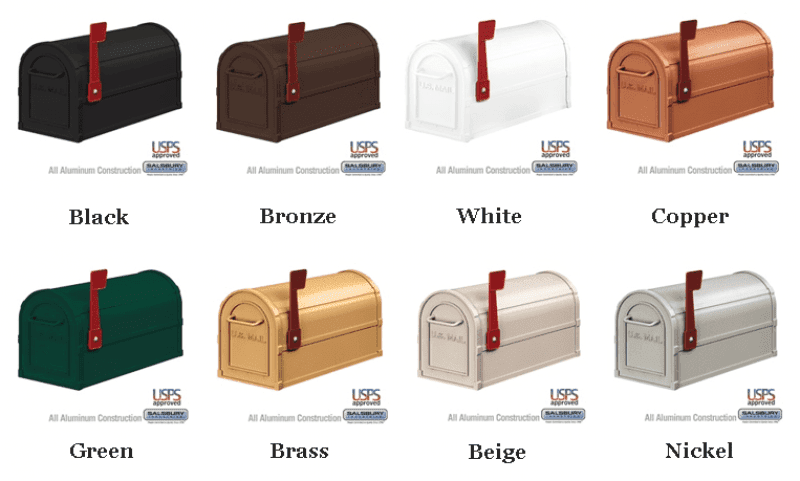 Use the form below to select your mailbox and color choice.